Greece – historically, Hellás, and, officially, the Hellenic Republic – is a country in southeastern Europe, situated on the southern end of the Balkan Peninsula. The country has borders with Albania, the Republic of Macedonia and Bulgaria to the north, and Turkey to the east. The Aegean Sea lies to the east and south of mainland Greece, while the Ionian Sea lies to the west. Both parts of the Eastern Mediterranean basin feature a vast number of islands, islets, and rock islands. Modern Greece traces its roots to the civilization of ancient Greece, generally considered to be the cradle of Western civilization. As such, it’s the birthplace of democracy, Western philosophy, the Olympic Games, Western literature and historiography, political science, major scientific and mathematical principles, and Western drama, including both tragedy and comedy. Greece is a developed country. It’s been a member of the North Atlantic Treaty Organisation (NATO) since 1952, the Organisation for Economic Co-operation Development (OEDC) since 1961 the European Union (EU) since 1981, a member of the Economic and Monetary Union of the European Union (EMUEU) since 2001, a founding member of the Black Sea Economic Cooperation, and a member of ESA since 2005. Athens is the capital; Thessaloniki, Patras, Heraklion (on the Island of Crete), Larissa, Volos, Ioannina, Kavala, Rhodes and Serres are some of the country's other major cities. When in Athens, check out the public markets for jewelry, leather goods (bags and sandals), furs, ceramics, rugs, wood, and an array of natural products. And, don’t forget to stock up on jars of olives and extra virgin olive oil. 80% of Greece is mountainous and 50% is covered by forests. There are about 3000 islands, only a few hundreds of which are inhabited. The Mediterranean type of climate features mild, wet winters and hot, dry summers. 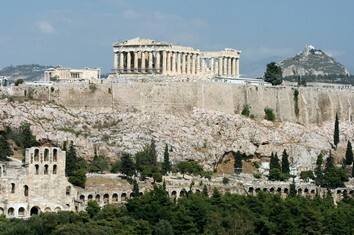 The Acropolis is the most popular archaeological site of Greece. Hundreds of tourists visit it every day to admire the Propylaea, meaning the entrance of the sight, the Erechtheum, the Parthenon, the Temple of Athena Nike and more. The New Acropolis Museum is also very popular since it exhibits all the items ever found on the famous rock. The fortified palace complex of Mycenae is one of the earliest examples of sophisticated citadel architecture. The legendary home of the Atreus, Mycenae is situated upon a small hill-top on the lower slopes of Euboea Mountain. The palace itself has largely been destroyed. The Greek island of Corfu lies to the north of the Ionian sea and is characterised by its natural beauty and archaeological sites. For a bit of culture, the Archaeological Museum and the Old Fortress are the perfect places to learn more about Corfu’s history. Kavos is the most action-packed resort on the island and its excellent nightlife and shallow waters make it popular with groups of young people and families. Epidaurus theater is one of the most important ancient sites in Greece, with an almost perfectly preserved amphitheatre built 2,500 years ago and still hosting Greek dramas today. The World Heritage listed site is located at the eastern end of the Peloponnese, 62 kilometres south of the Corinthian Canal. Cape Sounion is noted as the site of ruins of an ancient Greek temple of Poseidon, the god of the sea in classical mythology. The remains are perched on the headland, surrounded on three sides by the sea. The site is a popular day-excursion for tourists from Athens, with sunset over the Aegean Sea, as viewed from the ruins, a sought-after spectacle. The palace of Knossos is the grandest of the four Minoan palaces that have been unearthed in Crete, and its complex architecture has been identified as the legendary "Labyrinth"". The palace of Knossos was the stage for a plethora of fascinating myths in ancient Greece, built by the famed Architect Dedalus." There are several small islands very close to Crete: Gavdos island is the southest border of Europe and it is populated. The islands of Hrissi or Gaidouronissi, Koufonissi, Dia, Paximadia, Gramvoussa are much smaller and not populated. Most of them are popular destinations for one-day cruises from Crete. The Mykonos Islands, Greece, are like a rare and beguiling jewel consisting of a wealth of culture and beautiful merging into a melting pot of lush landscape and golden beaches. The sophistication of the Mykonos Islands only but enhances the attraction of this Greek holiday spot. Noted as being one of the most famously known islands in Greece. One of the most popular destinations in Greece is Santorini. Thousands of tourists visit Santorini every year. Santorini Greece is home to one of the most spectacular landscapes in the world.